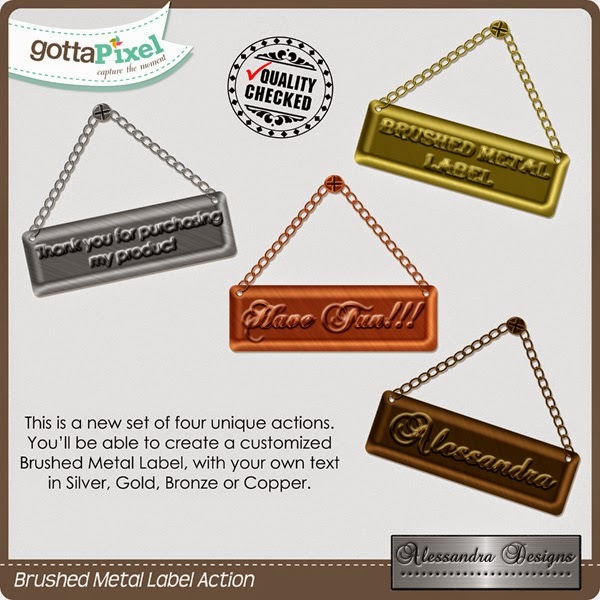 This is a set of four actions, that lets you create a very unique Brushed Metal Label in Silver, Gold, Bronze or Copper. You'll be able to choose your font, size of the font and type your text, creating a customized Brushed Metal Label to fit in your project. The brushed in the metal is gorgeous, and the screw it is not merged with the label, so you can use the Brushed Metal Label with any other hanger of your choice. As versatile as can be, you'll be using this action countless times!!! These actions were created in CS2 and also tested in CS3. Shadows on preview for display purposes only. Some elements resized smaller to fit on the preview. Available HERE at Gotta Pixel. Grand Opening Sale - Day 15 - FINAL DAY!